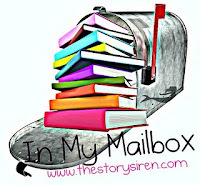 In My Mailbox is a meme hosted by Kristi at The Story Siren, where we share books we have received in our mailboxes this week. This is what I got from my special someone in a recent online order from Barnes & Noble. Hearts at Stake by Alyxandra Harvey - which I accidentally ordered in my haste when I actually meant to order Bleeding Hearts (Drake Chronicles #4)! All You Desire (Eternal Ones #2) by Kristen Miller; Bargains and Betrayals (13 to Life #3) by Shannon Delaney; Bloodlines (Bloodlines #1) by Richelle Mead, The Power of Six (Lorien Legacies #2) by Pittacus Lore; Hades (Halo #2) by Alexandra Adornetto, True Blood Graphic Novel Vol.1, The Sookie Stackhouse Companion and the Vampire Academy Graphic Novel. Since the closing of Borders, has anyone switched to buying their books from Barnes & Noble? Has anyone been experiencing problems with receiving their books? It two almost two weeks, a nasty email and an irate phone call for these books to finally find their way to my house. I've only made two online purchases through B&N and each time, my orders were delayed - almost canceled and then finally shipped. Why are they making me wait so long when I could have gone to my local Wal-Mart and bought it there. Very frustrating. Enough of my venting...What did you get in your mailbox this week? You got the Vampire Academy graphic novel (jealous face!). I got bloodlines too and can't wait to start reading. I recently received The Power of Six but have to read I Am Number Four first. The Sookie Stackhouse Companion was just released! I am interested in your opinion. Enjoy! Here's my IMM. I hope you'll stop by when you have a moment. You guys have inspired me to make The Power of Six my next read :-) I just hope I can fit it in between all this school work - ugh.